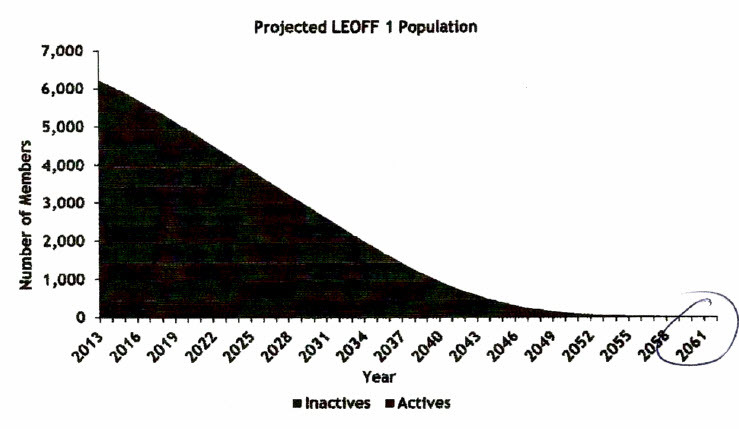 As you can see from the graph below, the projected LEOFF I membership is on a decline and picking up speed between the years 2022 and 2025. This first appears to be down the road or in the future, but wait a minute, just think back a couple of years ago when they were talking about the year 2000 and the millennium that was almost nineteen years ago. Time does pass quickly, that’s why any good company or organization must look to the future and plan. I have been addressing this issue for several months in our Newsletters, at our regular meetings and with other organizations to gain information, ideas or suggestions. What do we want and how do we want to represent retired firefighters, law enforcement officers and surviving spouses in the future? Do we want a loud voice, organized, educated and able to discuss our issues or do we want to rely on a concerned few people to write a letter or contact a legislator? Do we want the legislature to decide what is best for us or do we want to tell the legislature what is right and just for us? It’s time for you to speak out and tell us what you think is in our best inter- est. What type of group or organi- zation would you join to protect and improve your benefits? The RFFOW has been an exemplary organization since 1935 when a group of retired firefighters went to Olympia to lobby for improved pension benefits. At that time retired firefighters had minimum pensions with no cost of living adjustments (COLA). Some retirees with a pension qualified for welfare benefits. The group came back with an increase in the minimum pension and an annual COLA. RFFOW is suffering a decline in members. As I have reported recently we are down to about 900 members out of the 7,300 LEOFF I members of which about 3,400 are firefighters and the 5,000 LEOFF II retirees. We do have some law enforcement officers and LEOFF II members who have joined the RFFOW. It’s just not right or equitable for 900 to do the work and pay the cost for improving, and for protecting you and your spouse’s retirement benefits. When I say improvements you may say what improvements, just ask those members who married after they retired, the spouses who lost their pensions and had them reinstated or the divorced spouses who were granted a pension by the court and who would have lost their pension when the member most likely the divorced husband died. Those are but a few of the improvements we have made since 2000. I will remind you once again: We have passed 19 bills since 2000. If I don’t remind you of the progress we have made who will? I know that I’m preaching to the choir as you members receive our Newsletter. However there are many more members who get the Newsletter from the internet for- warded to them from our members or otherwise. I want to again thank those of you who have sent a donation for a special mailing or mailings to all LEOFF I members and maybe LEOFF II retirees. We have decided to send a short one or two page mailing as a questionnaire in January for you to fill out and return. We want to find out what you think the need is for representation, how an organization should be structured and the type of organization you would join. There is currently one organization who some of you donate to that has no elected officers, no meetings, no financial reports, no firefighter or law enforcement officer lobbyist, and no regular Newsletters. If that’s what you want we can put something like that together on a napkin over a cup of coffee. I don’t mean to be disrespectful but this is factual and an opportunity for you to make a choice. We receive a lot of questions regarding the makeup of pension and disability boards under RCW 41.16, 41.18, 41.26 and 41.20 police officer boards. There is some confusion or misunderstanding as to who can serve on these boards and who can elect the firefighter and police officer representatives on these boards. There are Prior Act police pension boards. These boards also serve as LEOFF I disability boards under RCW 41.26 the LEOFF I statute. There are Prior Act fire pension boards under RCW 41.16 and 41.18. These boards can also serve as LEOFF I disability boards under RCW 41.26. There are fire district pension and disability boards under RCW 41.18:015 and RCW 41.26 the LEOFF I law. There are county LEOFF I disability boards under RCW 41.26. There are city LEOFF I disability boards in cities with a population of 20,000 or more under RCW 41.26 the LEOFF I statute. The qualifications to serve on the various boards are pretty much the same but the wording describing who can serve may be a little different and confusing. One thing that is clear due to a bill that the RFFOW got passed, is that only those members who are under the jurisdiction of the board can elect the firefighter or law enforcement officer representatives. We may have a house- keeping bill introduced in the 2019 legislative session to clarify the language in the definition of who can serve and maybe to broaden the scope of who can serve. Maybe to allow any firefighter or police officer living in the jurisdiction the board serves, the opportunity to serve on a board. Again, due to a bill that we had introduced it’s clear that LEOFF II employees can serve if elected.